Despite widespread broadband coverage, there are still large numbers of users with dial up modems for Internet access, transaction processing, security and other applications. The need for dial-up is declining, but due to poor broadband coverage or the prohibitive cost of replacing equipment, in many instances it is still the best option. For the foreseeable future many Telcos will need to continue to provide and support dial data services. Much of the network equipment used for these services is no longer supported, therefore it will be difficult for the telecommunications service providers to support these customers. Additionally, having to maintain a TDM infrastructure does not align with the aim of service providers to move to all IP/Ethernet infrastructures. The Virtual Access RAS is a new generation system that comes with a commitment to long term support. It is based on Telco-class MicroTCA architecture and uses the latest distributed processing techniques. The modems are soft , running in general purpose processors, and do not depend on specialised hardware that may be at risk of obsolescence. The Virtual Access RAS supports a “Pure IP” access mechanism. 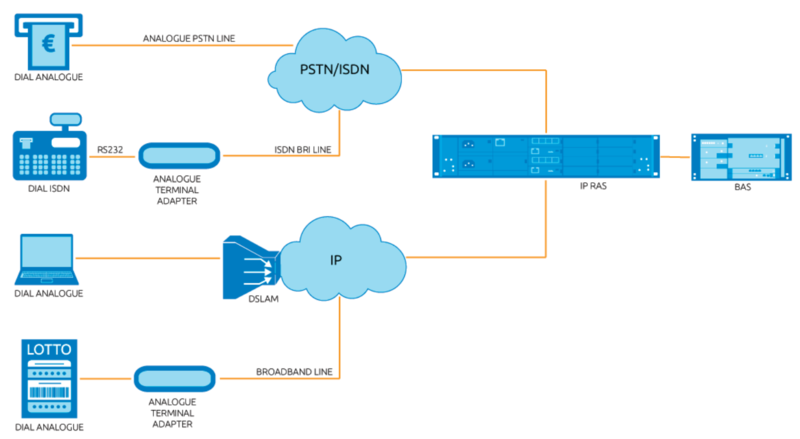 The IP RAS integrates with modern IP/Ethernet based IMS systems to connect to the access network using SIP and RTP. When this option is selected there is no requirement for ISDN PRI interfaces on the RAS; all connections are via Gigabit Ethernet. The Virtual Access RAS also supports ISDN PRI interfaces, enabling a direct replacement for legacy RAS equipment. RAS systems with ISDN interfaces can also support SIP/RTP interfaces and hence they can support the slow migration of the customer base from ISDN to SIP/RTP. L2TP and PPPoE can be used to deliver user traffic to ISPs, retailers or private networks. L2TP and PPPoE are common methods for the aggregation of broadband user traffic; therefore the L2TP Network Server and BAS infrastructure in place for broadband can also be used for dial access. 1.1.4 EMC and safety IEC60950, FCC CFR Part 15, EN55024, EN55022 Class B, EN61000-6-2, EN61000-6-4 & VCCI. 1.1.5 Power Single or dual AC or DC power supplies Note: The AC power supply will support a chassis with up to 4 PRI and 4 CPU cards. A DC PSU is required for a higher density system.